Bethlehem University Foundation invested new Patrons of the Bethlehem University Foundation at a reception at the Apostolic Nunciature in Washington, DC, on the 9th of November. The evening was graciously hosted by His Excellency Archbishop Christophe Pierre, Apostolic Nuncio to the United States of America. 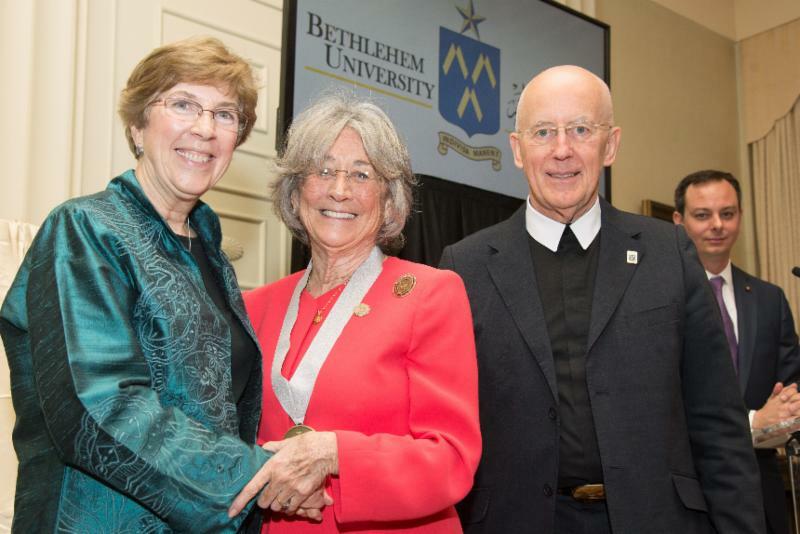 Pictured on the left are Sister Irene O'Neill, CSJ, Chair of the Board of Directors of Bethlehem University Foundation; Archbishop Pierre; and Brother Peter Bray, FSC, Vice Chancellor (President) of Bethlehem University. 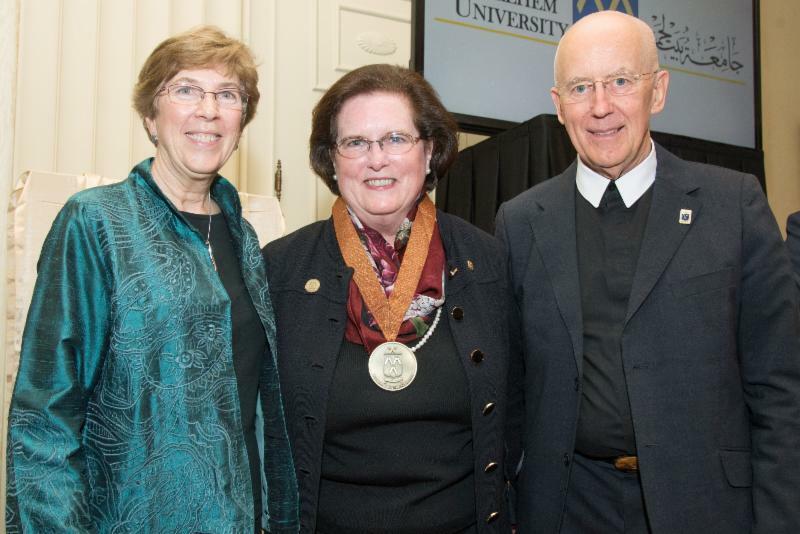 The Reception was the most successful in the Foundation's history, raising over $270,000. Thank you for your generosity. 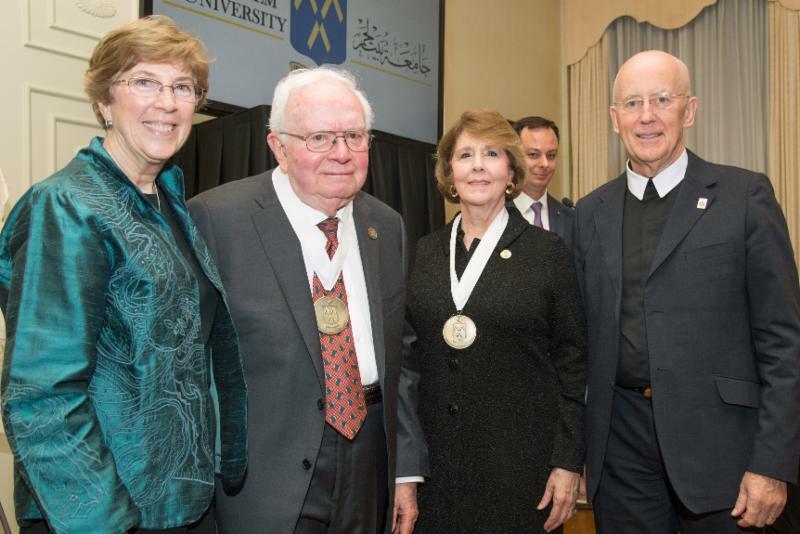 During the reception, the Foundation announced the creation of the Theodore Cardinal McCarrick Endowment, through the generosity of The Andreas Foundation, to support the Faculty of Nursing and Health Sciences at Bethlehem University. This endowment will ensure that the training of nurses is first-rate as they bring health care to a part of the world very much in need of healing. 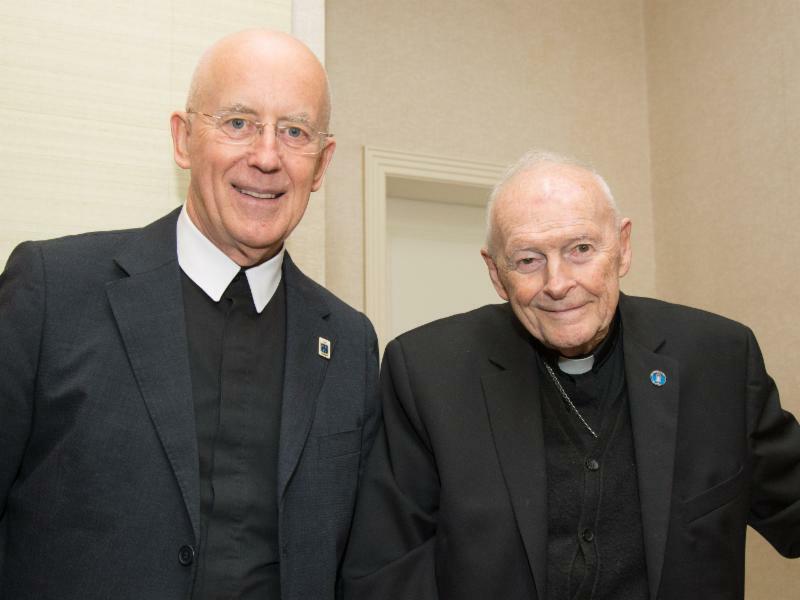 Brother Peter Bray is shown with His Eminence Theodore Cardinal McCarrick, Archbishop Emeritus of Washington. 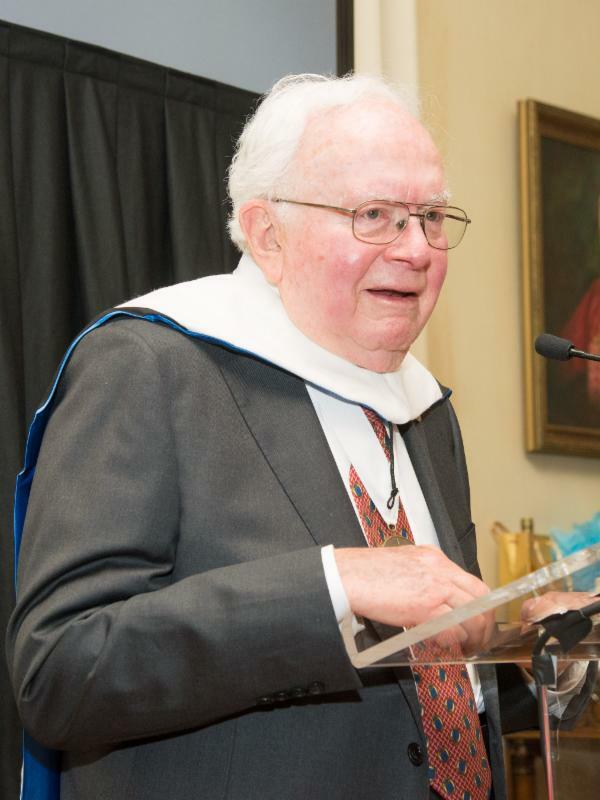 You can contribute directly to the Theodore Cardinal McCarrick endowment by clicking here. Please select the endowment as your designation. 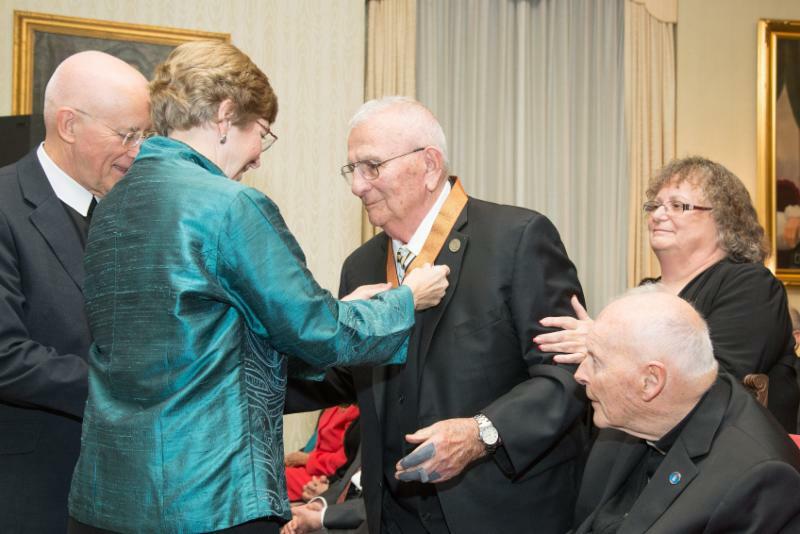 Archbishop Pierre and Brother Peter Bray presented Mr. Frank Jungers with a Doctorate of Humanities, Honoris Causa, from Bethlehem University in recognition of his leadership, and his outstanding support for education and Bethlehem University. Mr. Frank Jungers began his career as a field engineer with the Arabian American Oil Company (Aramco) in San Francisco, after which he was transferred to the Kingdom of Saudi Arabia, where he eventually became the President, Chairman, and Chief Executive Officer of Aramco. Mr. Jungers has been a valuable advisor and leader in the efforts of Bethlehem University to expand its reach and reputation. Mr. Jungers served on the Campaign Cabinet for the University. In December of 2016, the Board of Directors of Bethlehem University Foundation created the Patrons of Bethlehem University Foundation. 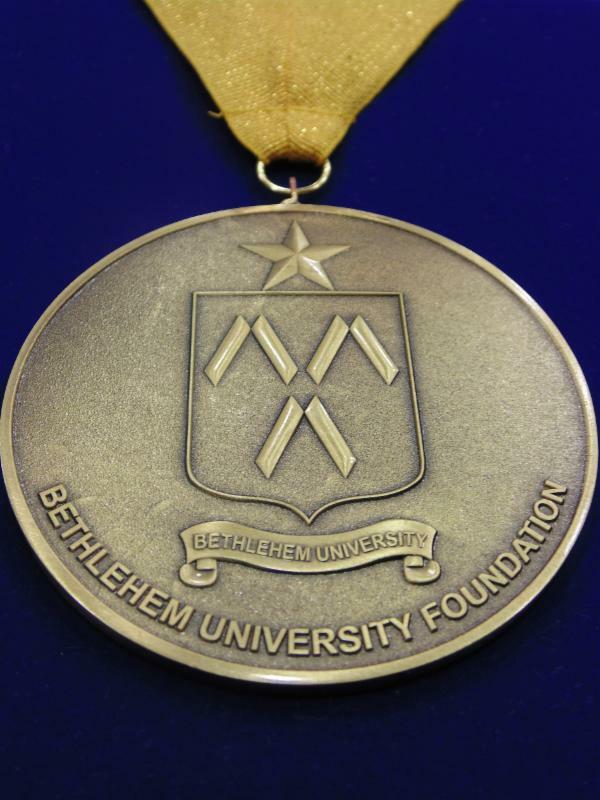 The Patrons are those individuals or couples who make a qualifying gift to the Annual Fund of the Bethlehem University Foundation. By contributing directly to the Annual Fund, the Patrons invest themselves into the work of the Foundation in its sole mission of supporting and promoting Bethlehem University. The Patrons serve in an advisory capacity to the Executive Director and hold an annual meeting. The Patrons are recognized at all Foundation events. 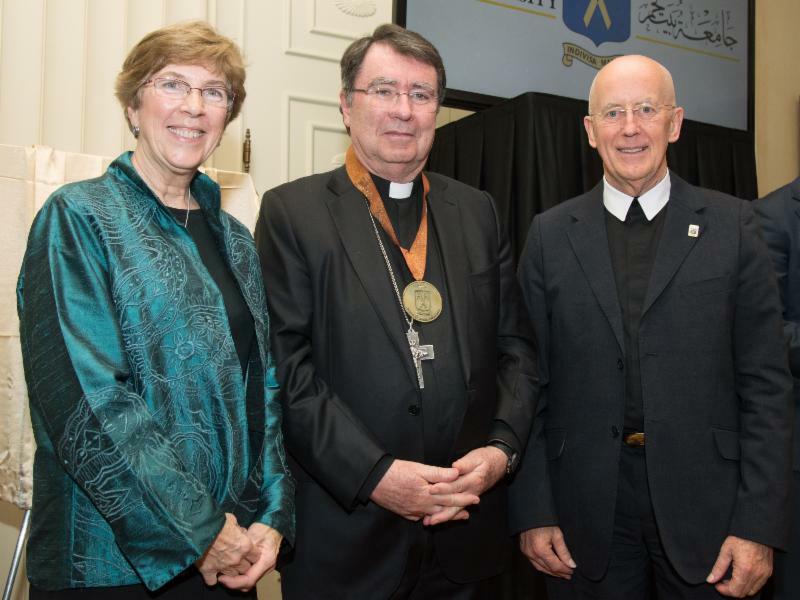 Archbishop Pierre was invested as an Honorary Patron of Bethlehem University Foundation. 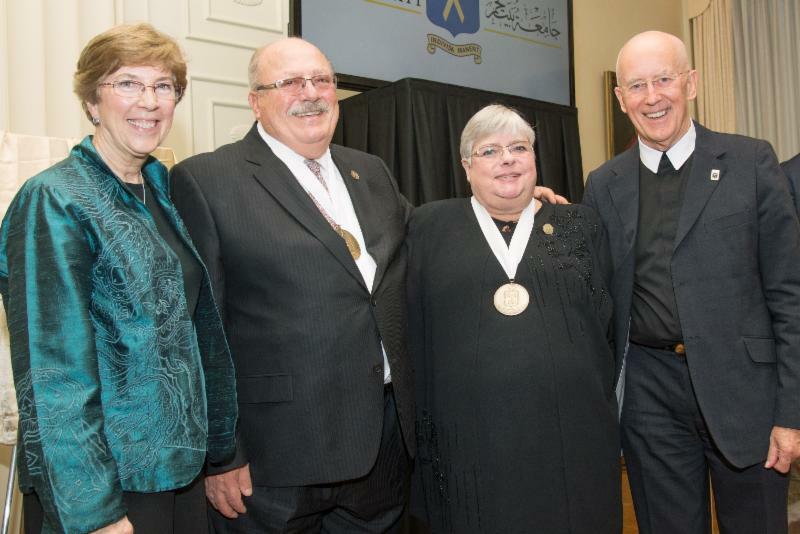 Mr. John Henry Butta and Ms. Anne Butta; Her Excellency Mary Currivan O'Brien, LGCHS; and Mr. George and Mrs. Breda Shelton were invested as Bronze Patrons. Mrs. Sandra Andreas McMurtrie (right) on behalf of The Andreas Foundation was invested as a Silver Patron. Mr. Ghassan and Mrs. Suava Salameh were invested as Gold Patrons. 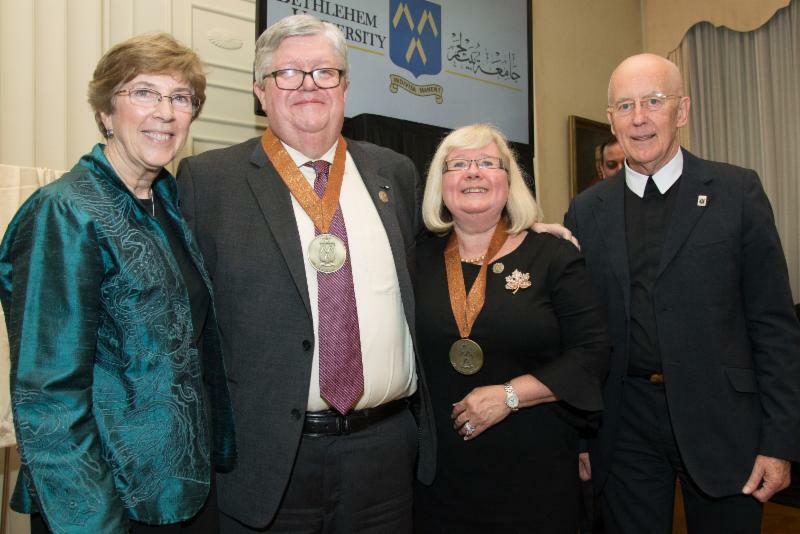 The title of Legacy Patron of the Bethlehem University Foundation is bestowed upon individuals or couples who have generously supported the work of the Bethlehem University Foundation by creating an enduring legacy through scholarships, endowments, building projects, or other means of support. The title of Legacy Patron is bestowed by Resolution of the Board of Directors of the Bethlehem University Foundation. 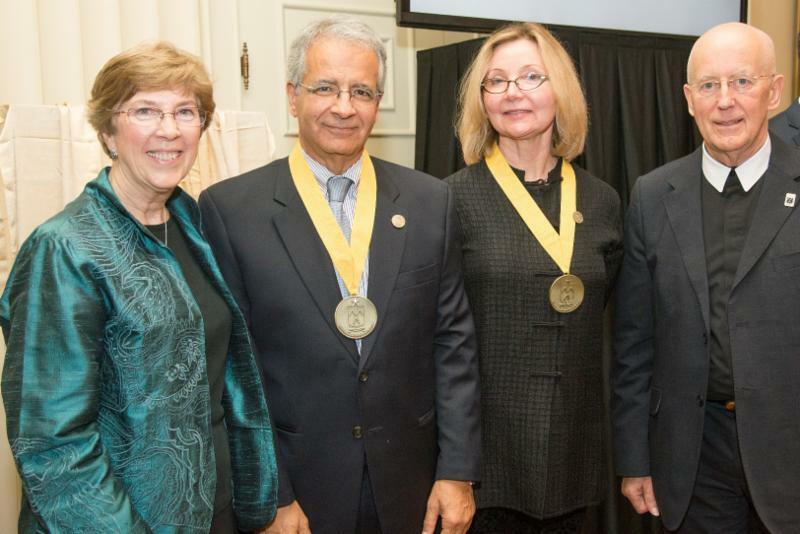 Dr. Samir and Mrs. Mary Abu-Ghazaleh (left), and Mr. Frank and Mrs. Julie Jungers were invested as Legacy Patrons of the Bethlehem University Foundation. To view more photos from the event, please click here. The Patrons have been underwritten by the generosity of Dr. Samir and Mrs. Mary Abu-Ghazaleh. 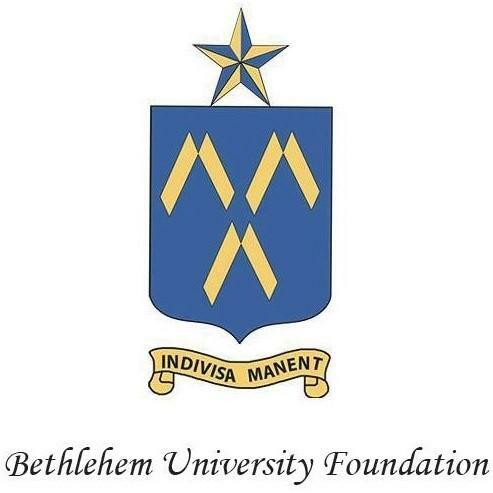 The Bethlehem University Foundation is the U.S. 501c(3) not-for-profit corporation entrusted with the sole mission of supporting and promoting Bethlehem University. The Foundation is a means for United States citizens to make a tax deductible donation to Bethlehem University.